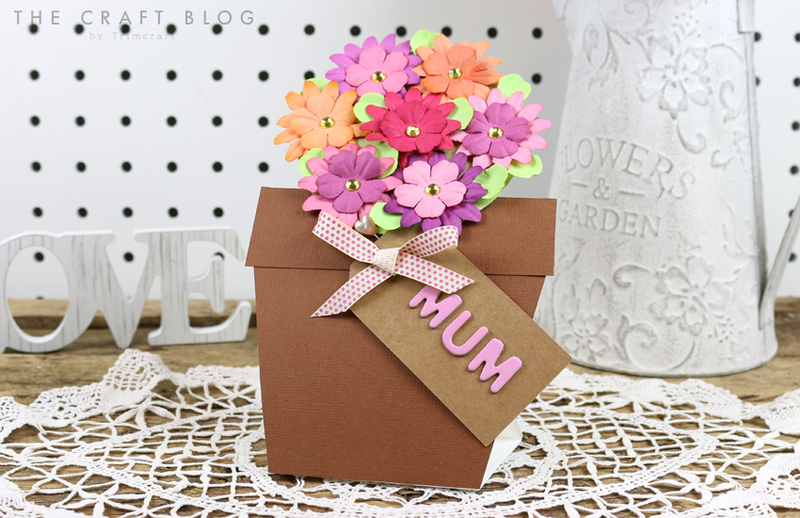 Flowers make any mum feel warm and fuzzy so today we're going to show you how to use our free template to create this adorable flower pot card shape! 1. Print off the free template and cut out the elements. 2. Draw around the flower pot shape and the other elements from the template on to a piece of Dovecraft white card, cut and score where shown. 3. Adhere the stopper to the back of the card, where shown on the template. Ensuring the fold of the stopper is along the top. 4. You card should now fold together nicely as shown in the picture below. The back of the card should fit into the stopper. 5. 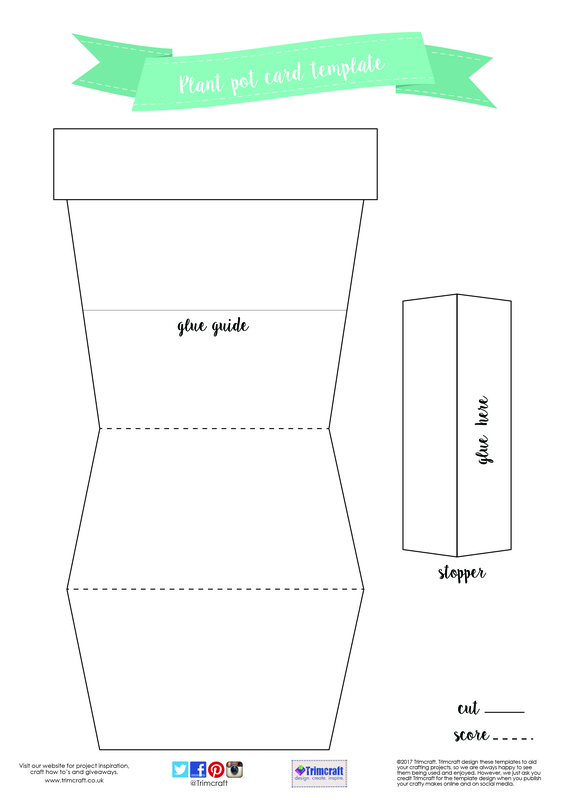 Draw around the plant pot top and front on to a sheet of First Edition brown textured card stock, adhere the front to the card, ensuring to only add glue around the edge of the plant pot. This unglued area will allow space to add a tab. Add the plant pot top to the plant pot. 6. Cut a 17cm x 8cm piece of Dovecraft white card. Layer on a 17cm x 8cm piece of First Edition green textured card stock. Repeat this step but instead, cut out a circle, approximately 10cm in diameter. Glue the circle to the top of your vertical strip, ensuring to only adhere the top half of the circle. 7. Place your tab in to your card and begin decorating the circle with Simply Creative paper flowers. Use 3D foam pads to add dimension. 8. Cut the green paper flowers down to create small leaves. Glue these next to your flowers to add more detail. Use a tool to curl the leaves to add dimension. Apply Simply Creative gems to the centre of each flower. 9. Adhere the word ‘MUM’ to your kraft tag, using the Simply Creative Alphabet Stickers. Use foam pads to adhere the tag to the pot, at an angle, underneath the top of the pot. 10. Make a bow with a length of Dovecraft ribbon and glue it down to the top of your tag. 11. Add two Dovecraft Couture du Jour pins to the back of your tag, pushing the ends into the foam pads to keep them secure. 12. Remove the flower tab and stamp the Dovecraft A7 stamp sentiment to the centre of the tab. Stamp or right the word PULL to the back of the tab. This card shape is so beautiful and it will be such a surprise to find the hidden and heartfelt message! This design will be wonderful to use all year round, for your chosen occasion. Whether you use it for Mother’s day, a birthday or as a get well soon present, this card will really make a loved one smile. Are you excited to use our free card shape template? Upload your wonderful makes to the inspiration area and to #trimcraft when sharing on social media, we would love to see.